Miter-Rite is the finest non-powered miniature tool you can buy for making perfect angle cuts in wood, plastic and soft metal. Cuts are adjustable in 1 degree increments with a range of 65 degrees on each side of 90 degrees. 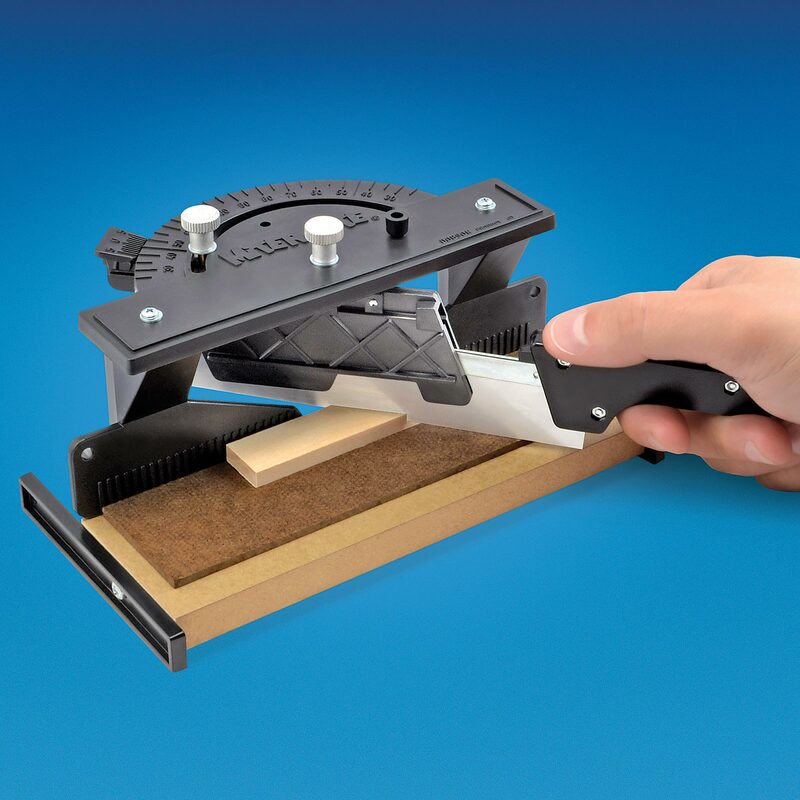 Blade holder keeps blade absolutely perpendicular to the base, assuring straight and accurate cuts. Made of tough football helmet Cycolac plastic for a lifetime of use. Comes with one 54 tpi saw blade. Cuts stock up to 5/8 inch thick x 2 inches wide x any length. Color may vary. I received my Miter-Rite last week and have had an excellent opportunity to put it through its paces, simple as they may be. Now I feel I must write you to express my delight in it, from its ease of use, through its quality of design and construction and on to the superb instructions, simple but thorough. A final touch is the inclusion of the spare pin and rubber foot pads. Most manufacturers just do not care to go the 'extra mile,' so to speak. I use this for cutting the masts on my custom cutter for the first time yesterday. Had to get the hang of it I think I tighten it too much but I got it now! Probably one of my most used little tools on my last project! it works. Makes angled cuts at any degree you want. would buy again. Used this for my dollhouse! A friend recommended micromark and this product so I decided to give it a try. Worked very well for my dollhouse furniture!! !